Join us at the Holiday Inn Sydney Waterfront for the best in local food and beverage. We pride ourselves on serving guests a winning dining experience in a contemporary, casual environment fitting of the awe-inspiring landscapes you’ll look out to when seated. Local products from produce to meat and fresh seafood are all provided by community businesses, ensuring you get the freshest meal around. 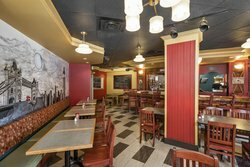 With a combination of fine dining at SaltSpray Restaurant and casual pub atmosphere at the Crown and Moose Pub, you always know your next meal is never more than a few steps away. Taste, live and experience the local culture. 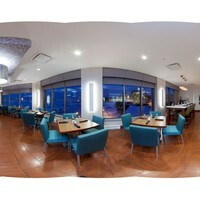 The crown jewel of fine dining in Sydney, Nova Scotia, SaltSpray Restaurant at the Holiday Inn Sydney Waterfront is home to a regional Canadian menu with sweeping panoramic views of the harbour. Modern décor is complimented by large windows that frame the room, lending themselves to create an immersive fine dining experience. There’s something on the menu for everyone but guests of SaltSpray shouldn’t miss our seafood specialities, especially in the summer- caught right from the ocean. Simply put, the Crown and Moose Pub is Sydney’s place to be on a week night or weekend. Local’s come here to relax and guests share in the relaxed, authentic Canadian atmosphere. Situated off the main lobby, you and your family, team, or group of friends will enjoy delicious and hearty pub food followed by beer on tap and a friendly Cape Breton smile from our servers. On Friday and Saturday evenings Crown and Moose Pub also plays host to live entertainment from an array of local musical talent so swing by and grab a cold one while you make like a local! Call 902 567 7014 for weekly listings. Ask about our Baby Boomer and Brunch Menus. 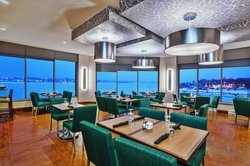 The crown jewel of fine dining in Sydney, Nova Scotia, SaltSpray Restaurant at the Holiday Inn Sydney Waterfront is home to a regional Canadian menu with sweeping panoramic views of the harbour. There’s something on the menu for everyone but guests of SaltSpray shouldn’t miss our seafood specialities, especially in the summer- caught right from the ocean.